I could go into a hundred reasons why I stopped posting here, but none of them are good reasons. So instead of trying to justify it, I’m choosing to simply accept that it happened and move forward. Let’s start with my college’s roomie’s wedding cake. Niki and I hardly ever see each other anymore, but this woman is my family. We can not talk for months at a time, and when we finally do see each other, it’s like no time has passed. The wedding to her college beau, Patrick, took place in the city where we all met, Santa Cruz, CA. Niki had requested something something beach themed, but not kitschy. Kitschy is when you throw every image of a theme into the design, whether or not it makes the design flow as whole. Basically, she was telling me that she wanted *actual* beach, not the tourists that came with it. Sea otters hold hands while they sleep so they don’t drift apart from each other. 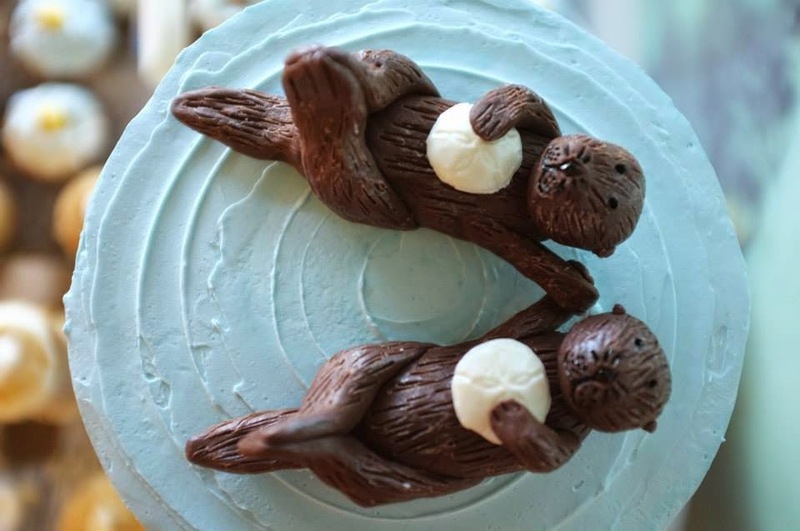 🙂 The otters and all other decorations are made of chocolate. 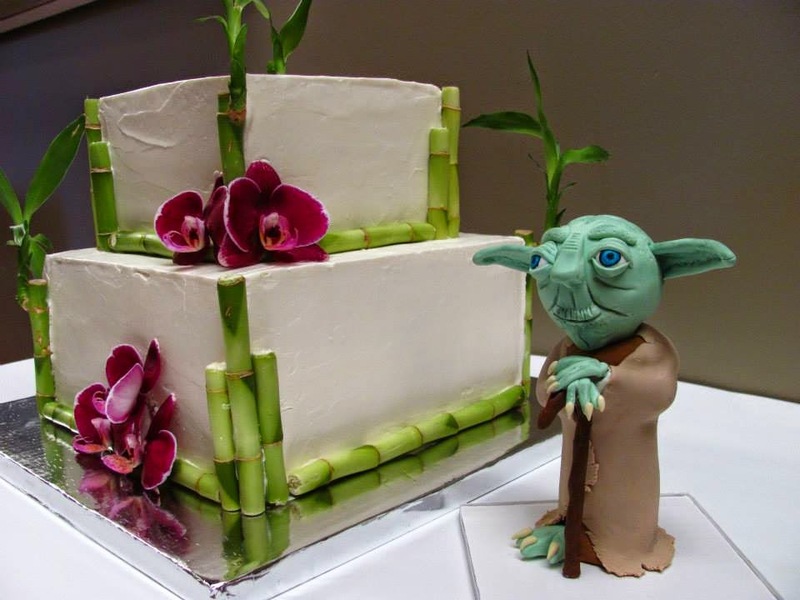 This is what I refer to as “The Yoda Cake.” Even though the cake wasn’t Yoda themed, the couple had requested a Yoda topper that they could keep to go alongside their bamboo and orchid aesthetic. Stands watch over the cake, Yoda does. Those who know me know how much I love Halloween. 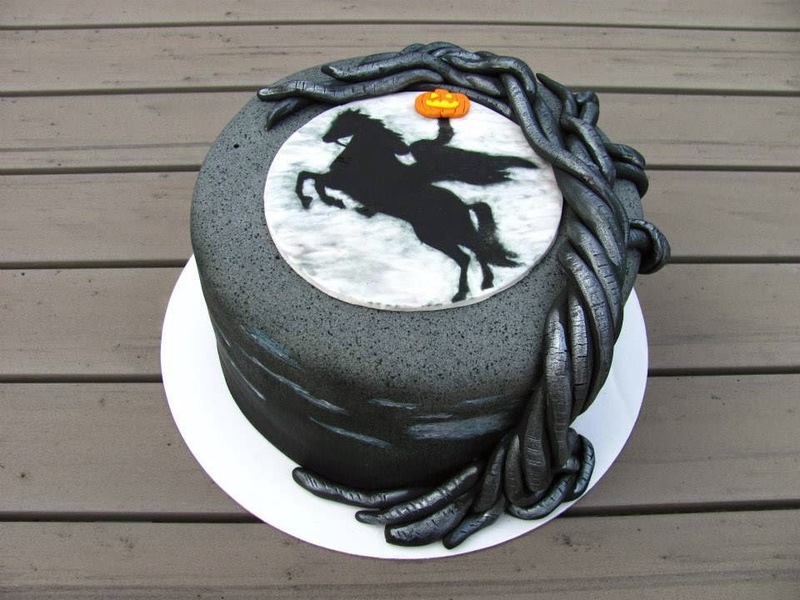 So I was super stoked to get an order for a Headless Horseman cake a few Octobers ago! I can’t decide which is my favorite part… The horseman or the tree. 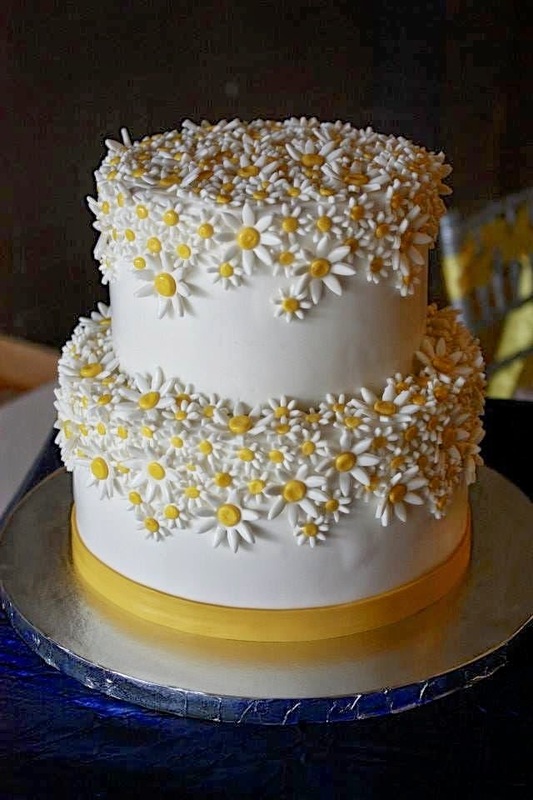 The bride for this cake loved daisies. After sending me an image of a cake that she liked which had different flowers, I decided to customize the design by using her favorite flowers. 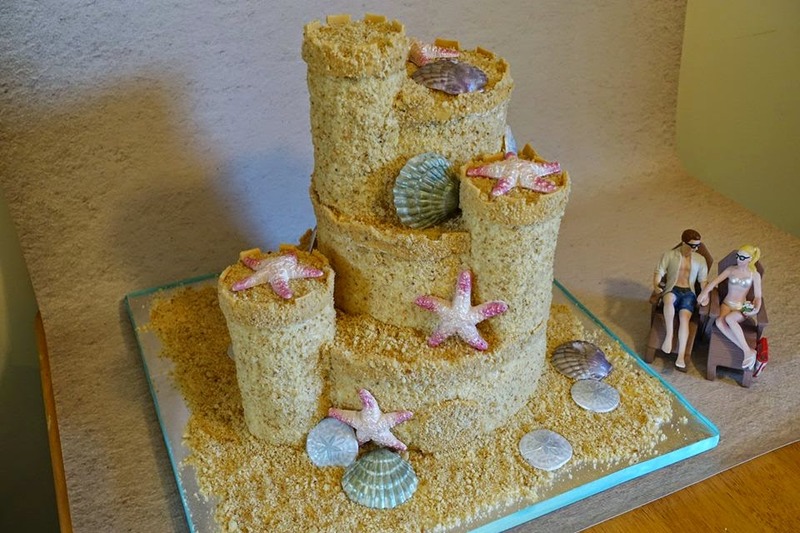 The mother of a bride came to me with a story of how her daughter had been so disappointed when the caterer refused to make her a sand castle cake for her outdoor wedding. In Florida. In July. She wanted to surprise her daughter with her dream cake when she came home to visit during Thanksgiving. Can’t say I blame the caterer for making that call, but I’m glad I had the opportunity to make this one. 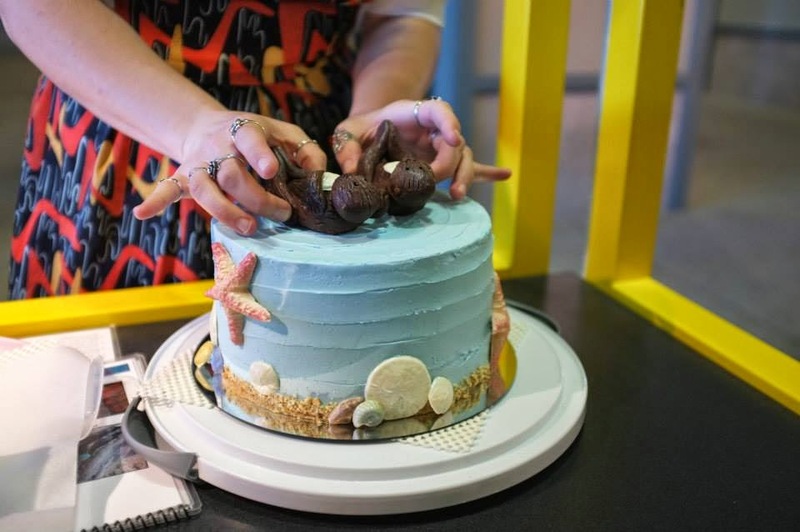 The seashells are chocolate, and the sand is made of crushed almond shortbread. My florist/party planner friend, Beth of Sassy Diva Designs and Events, recently held a “Dyslexic Sweet 16” party for her mother, who turned 61 this year. After showing me a square cake with chocolate covered strawberries for inspiration, I came up with this little (read: big and heavy!) number. 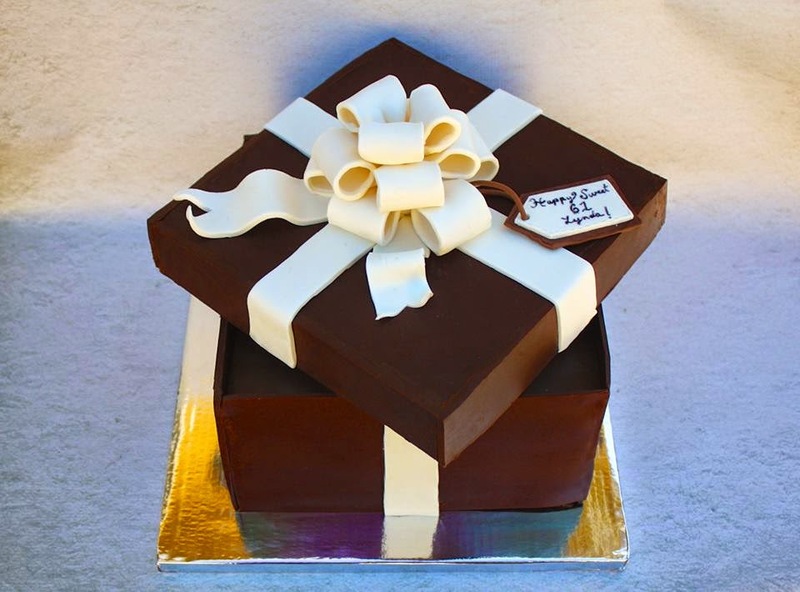 A fondant-free piece, this one is done entirely in the birthday lady’s favorite medium, chocolate. I’m still new to the whole cake photography thing, so (almost) none of my photos of this cake turned out as well as this one, taken by the client after delivery. I had purchased a cake onlay via online order, and neglected to notice how long delivery would take. Luckily, the ever-so-kind Lesley of Royal Bakery came to my rescue by loaning me some stencils the day before this cake was due. 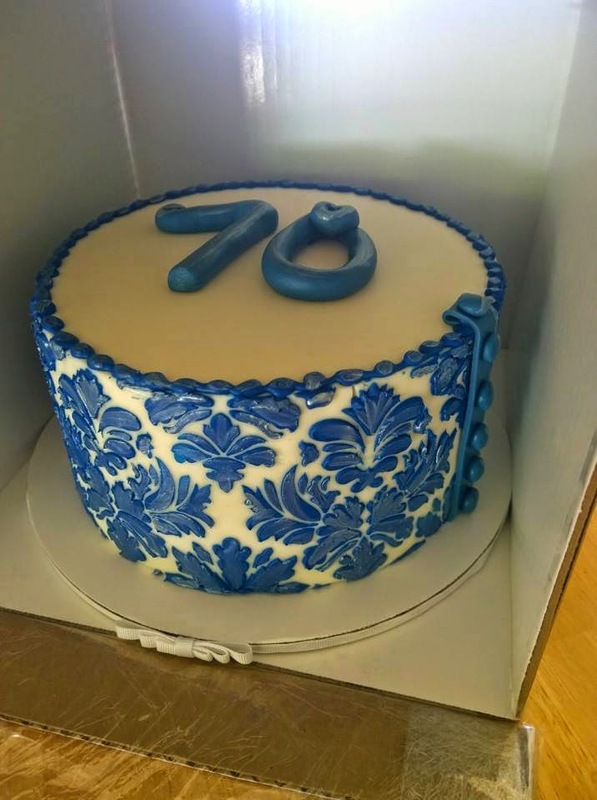 The results were a success (the client CRIED REAL TEARS when she picked up the cake,) and I am officially in love with stencils! 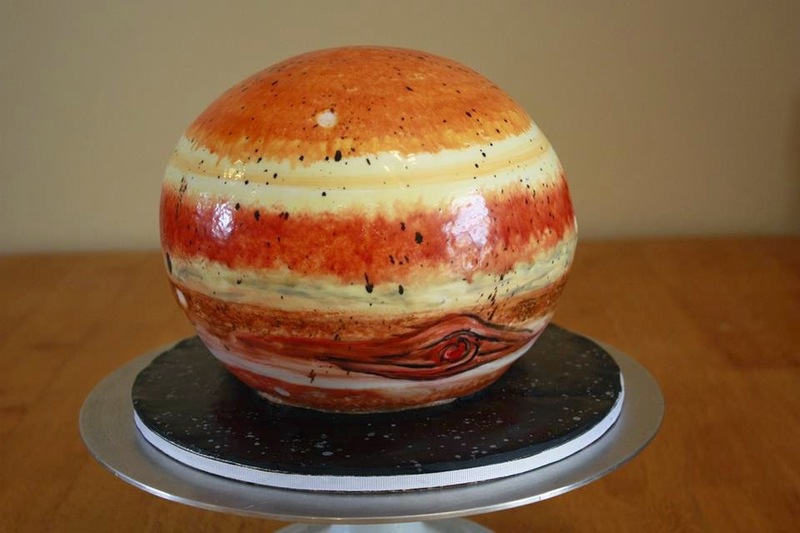 I would *love* to learn how to properly paint with buttercream. I hear it’s much like oil painting, in that you use palate knives instead of brushes. 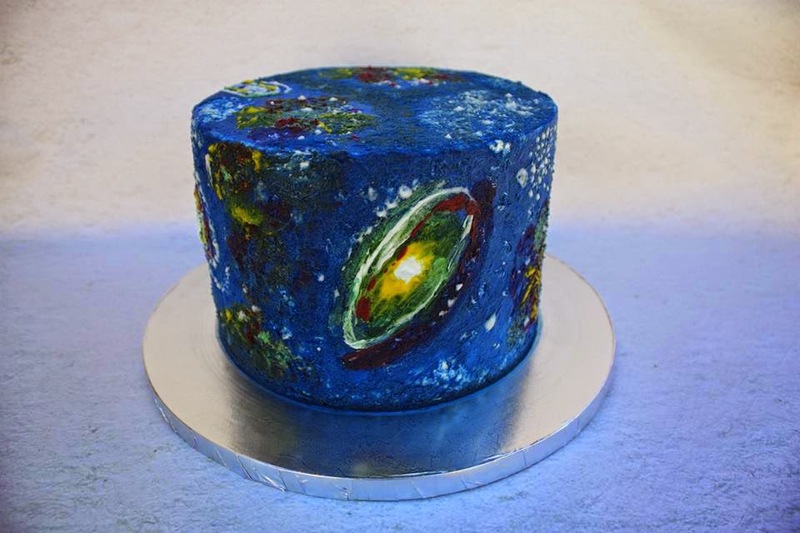 I’ve never done oil painting before, but it’s got to be easier than trying to wing my way through a cake with buttercream and a paint brush, which is what I did for this astronomy-themed birthday cake. “Squidy,” as he has become known at my house, was a baby gender reveal cake for my other sweet college roommates, Liz and her hubby Wilson. Lemon cake with basil buttercream and blueberry filling had the pleasure of announcing that they were expecting a boy! These guys traveled with me by car all the way to San Diego for the couple’s 20,000 Leagues Under the Sea themed baby shower. Presenting… Pedro, the Birthday Burro! 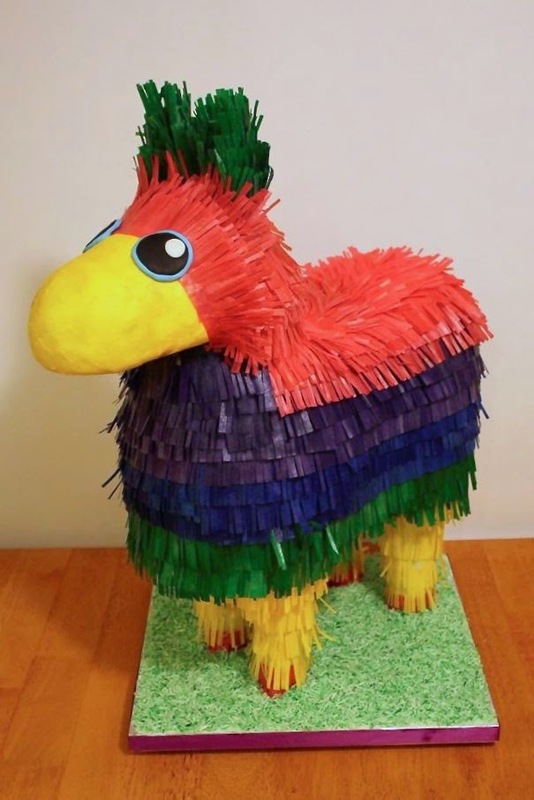 Yes, he’s a piñata, AND he’s a cake. 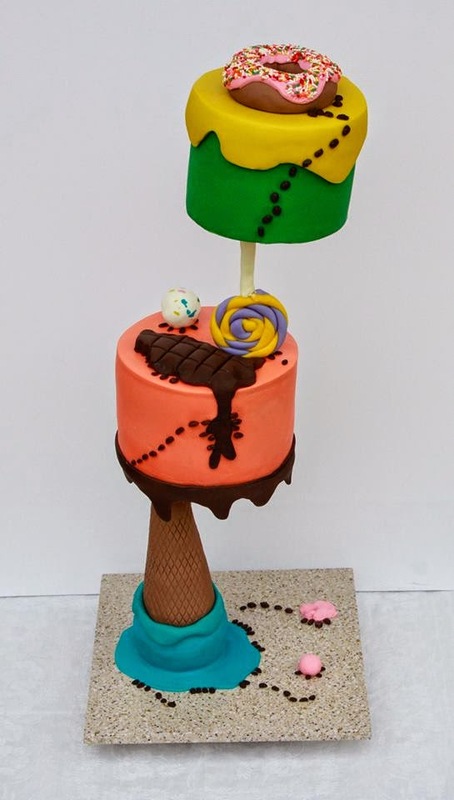 He’s a piñata cake! 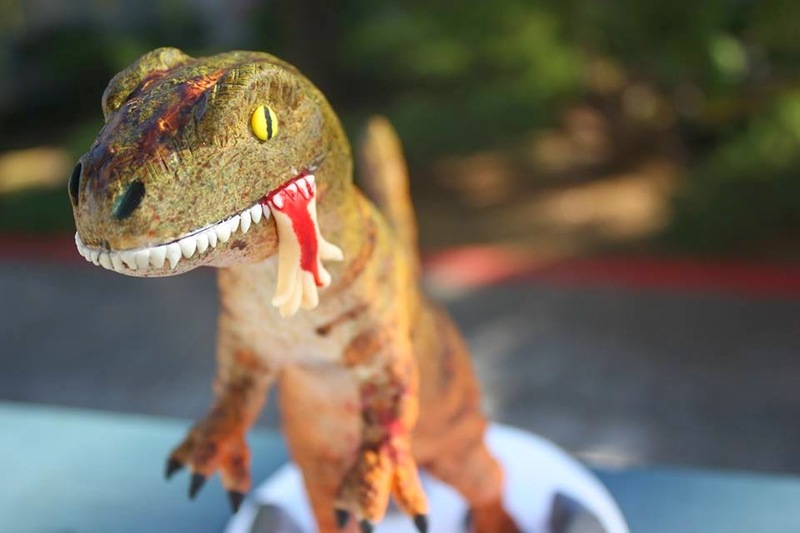 You can eat the paper, and when you cut him open, candy falls out. He also weighed eleventy million pounds. Hi! 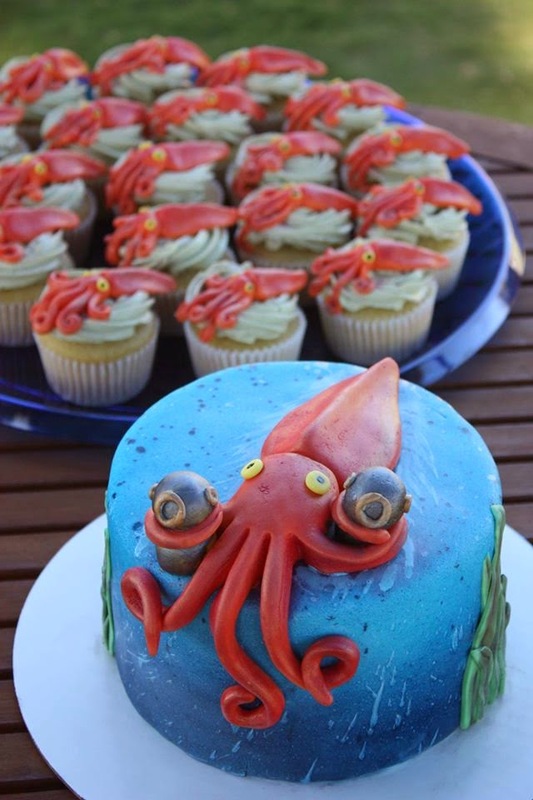 I love the squid cake! How did you get the splashes of light color on the dark? Would you be willing to share? I’d love to use the same affect and would really appreciate it!